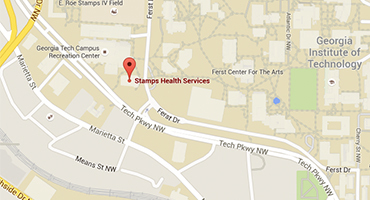 Stamps Health Services is a great asset to the students at Georgia Tech. This is made possible through the student health fee mandated by the institution and approved by the Board of Regents annually. To assist students with fees and payments, our Customer Service Representatives will be happy to explain our policies and options. They also assist students when a referral is ordered by our medical staff. We also have an Insurance and Billing Coordinator who assists students with understanding their StudentBlue benefits, billing and reimbursement. Affiliate Postdoctoral Scholars, J1 Scholars, and Option Practical Training (OPT) participants are eligible to use services of Stamps Health Services Pharmacy and Tech Dentistry at Stamps Health Services. Although most services are included in the health fee, some charges apply. Our services are also available on a fee-for-service basis. Stamps Health Services participates in the Student Health Insurance Plan (StudentBlue). This is the only insurance plan with which we work.